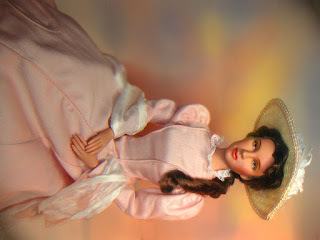 What you see is a repainted Tonner Scarlett -- not to look like Vivien Leigh, but an imaginary character inspired from classical paintings of women. I think I was thinking of images of Maine and Monet when I thought of doing this portraits. I had been long looking at Ashton Drake's Midnight Angel Ensemble, somehow haunted by its beautiful detail. 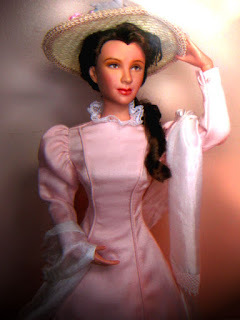 Thinking this would be perfect for an Edwardian/Victorian outfit for the Tonner Scarlett mold. I was never drawn to strong featured dolls. I personally think that feminine-ness is close to beautiful-ness! And so thought of repainting this close to classical soft features in paintings of women. The outfit is just the cape over the doll. The skirt was a creation of Alana Bennett (notice the nice embroidery at the bottom which Alana did -- a good value if you have her do a gown for you; she does do more). The inside gown has "leg-o-mutton sleeves" and is made of a wonderful pale rose cotton, lace collar and detachable cummerband. Notice also the beautiful detail that Ashton Drake did at the bottom: a "looping" applique. Underneath this, you will find a full netted crinoline. The navy blue wall coat is faithful to capes done during the period as it is made of wool; edged with gold piping along its hem. There are bows at the back is fully lined. The top of the coat sort of flies so I had to clip it at the back (thanks to Nikki for that suggestion). 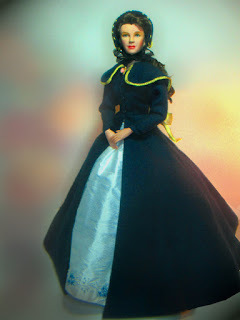 The pale rose dress underneath (I am surprised) fits the doll well; you just have to tug a bit-- although I would think she would be uncomfortable with it -- who wasn't during the Victorian/Edwardian corset era. Notice the bonnet of gold brocade, black chenille and black cord. I adore the little rose brooch! The outfit also comes with pearl earrings which the doll is not wearing. The dress is designed by Nicole Burke, winner of the 1997 Young Designers of America Student Competition. You have to hand it to Mel Odom for giving that opportunity to a lot of young talent. Over-all I think that Gene's clothings are classic and each one worth getting -- whatever fits your collection. I hope you enjoy the portraits! Thanks to Joe Blitman of www.joeslist.com for this outfit. Coming up next: Vivien Leigh does Ashton Drake.